At the National Association of Public Health Statistics and Information Systems Annual Meeting in Memphis in June, Krista Bauer, Registration and Amendments Supervisor for the Office of Vital Records (OVR) presented, “Adjudication Trifecta—Collaboration Across Agencies to Improve the Completeness and Accuracy of Birth Records.” The national audience of more than 300 vital statistics professionals was eager to hear how Minnesota is working to assure that legal parents are listed on their children’s birth records. Krista’s presentation emphasized the significance of three separate and very different state agencies coming together to strengthen families—a trifecta that provides a win for everyone. Krista explained how OVR, the Minnesota Department of Human Services, Child Support Division, and the Minnesota Courts initiated a pilot project in 2015, to improve data on birth records. Each year in Minnesota, about 22,440 (33%) infants are born to unmarried mothers. A large percentage of unmarried parents establish paternity at the hospital at the time of birth registration by voluntarily signing the Minnesota Recognition of Parentage Form (PDF). When this happens, both the mother who gave birth and the man who is the biological father are recorded on the child’s birth certificate. For families who wait to establish paternity, only one parent, the woman who gave birth, is on the birth record. Later, some parents establish parentage in court through a paternity adjudication. Annually about 4,500 petitions are heard and determined in Minnesota courts. Some of these actions are through family court, but most are initiated through the child support system. The problem is that birth records aren’t automatically updated when this happens. Someone has to file the court order with the vital record office in the state where the child was born, request that the record be updated, and pay a fee. When no one takes these steps, both legal parents do not show on their child’s birth record. Confidence in the accuracy of vital records is important. Unreliable records can lead to other problems and frustration felt by the public, child support, vital records, the legal system and others. Two years ago, Minnesota initiated a pilot project to solve this problem. OVR proposed a simple solution to eliminate barriers and streamline the process. OVR introduced a “Certificate of Adjudication” (PDF) form similar to a form used for adoptions, to provide information to vital records. The three state agencies worked together to develop a process to complete and file the form so that birth records would be updated. Initially five counties piloted the form which requires the court administrator to complete sections and forward it to OVR. OVR updates the child’s birth record and bills the county child support office for the fee. Immediately the agencies saw improvements. More birth records were updated by OVR, fewer requests were rejected (from nearly 50% to 1%) because OVR had all the information it needed, and the processing time to file these and update the birth record was reduced from about four months to a few days. Last fall OVR, Child Support, and the courts agreed to expand the pilot project statewide. Today 34 counties and tribes are participating with others expected to join soon. Further, because of the success of the pilot project and the importance of having complete birth records, the Minnesota Department of Human Services proposed legislation last session to cover the fee for all court-ordered adjudications for Minnesota born children even when the actions were initiated outside of child support. The pilot project continues and the agencies hope that it expands to all 87 counties. The early process improvements have been sustained and continuous improvements are sought. It’s likely that similar legislation will be put forward next session establishing the certificate of adjudication in law. Medical certifier not in MR&C? Call the Help Desk! Accuracy is a priority for the Office of Vital Records (OVR). Having data tables in the MR&C System that are complete and up-to-date is important for timely vital records registration. When registering the fact of death, funeral staff need to select the name of the medical certifier who agrees to provide cause of death from the search results drop-down menu. If you cannot find the medical certifier by entering the first few letters of each name, OVR prefers that you contact the OVR Help Desk at 651-201-5970 or health.MRCAdmin@state.mn.us to request addition of the medical certifier’s name. Provide OVR with the medical certifier’s full name, credentials (MD, DO, CNP etc. ), license number, and medical facility name if they are associated with one. The Help Desk will confirm that the medical certifier is not in the table and get the table updated, or will help you find the medical certifier in MR&C. Your request notifies OVR to add the medical certifier to the MR&C medical certifier table and prompts OVR to recruit the medical certifier as an MR&C user to register cause of death electronically. Adding the medical certifier’s name to the drop down list alone does not create a medical certifier MR&C user account. OVR is unaware that a medical certifier is not in the medical certifier table. Depending on your browser, may save your entry for re-selection. Medical certifier will not receive the “Pending cause of death” email. Contacting OVR to request that we add a medical certifier assures that the entry will be complete and that OVR staff will contact the medical certifier to sign up to become an MR&C user. When a medical certifier completes the user agreement and OVR creates the user account, the medical certifier gets notifications through MR&C prompting them to complete their part of the death record. The names of many Physician Assistants and Advanced Practice Registered Nurses are not yet in the medical certifier table. Please collaborate with OVR to recruit these new medical certifiers and assure that they have access to electronic death registration. Email medical certifiers the Medical Certifier and Designated Staff User Agreement (PDF) instead of perpetuating inefficient paper death registrations. Help us help you. The Midwest Medical Examiner’s Office started processing all cremation authorizations electronically using Minnesota Registration and Certification (MR&C) on July 1, 2017. The Midwest Medical Examiner’s Office joins the Hennepin, Ramsey, and Southern Minnesota Regional Medical Examiner offices (representing 53 of 87 Minnesota counties) in reviewing cause of death information and approving cremation authorization requests electronically in MR&C. Paper/faxed cremation authorization requests are no longer accepted at these ME offices for many reasons. Dr. Strobl, Chief Medical Examiner for Midwest, recounted the story of an avoidable problem of a faxed paper cremation authorization that demonstrates why paper is not an efficient process in today’s electronic world. Not only was it frustrating for the funeral home and ME’s office, but the paper process delayed the death registration for the family. Read more about Dr. Strobel’s commentary here. The transition from paper to electronic death certification aligns well with the Minnesota Paper Cut Project, a two-year project to improve the timeliness and quality of death registration. As part of the Paper Cut project, the Office of Vital Records (OVR) is implementing a no paper policy on October 1, 2017. The no paper policy means that medical certifiers (or their designated staff) enter the cause of death information into MR&C. OVR will no longer enter cause of death information from paper worksheets faxed to OVR. Tell your colleagues who may not receive Vital Records News. OVR invites medical certifiers not yet participating in electronic cause of death filing to come on board with the rest of our partners. Learn how to become an MR&C user and designate staff to enter cause of death on your behalf by visiting the Death Registration for Medical Certifiers page. 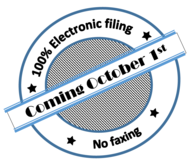 By completing and submitting the Medical Certifier and Designated Staff User Agreement (PDF) , you will be ready to comply with electronic only filing on October 1, 2017. Last month we wrote about changes to branding and Minnesota’s new look. We mentioned that the Office of Vital Records (OVR) is reviewing, revising and replacing the forms that our customers use to request vital records documents and services. You may have noticed that OVR has some forms back to the early 2000’s — two logos ago! Not only do the logos need updating, so does the content of the forms. In addition, the old forms do not adhere to federal standards for accessible documents. Three good reasons to review, revise and replace! OVR is filling in the gaps related to our customer forms. Our goal is to provide customers with forms that are understandable and with instructions and information about tangible interest requirements that are clear. We want to reduce the number of rejected applications and encourage more uniformity in the services we deliver. What form do you need that we (OVR) do not have? Do customers ask for documents that have no order form? Do you want to modify or customize OVR forms for use in your county vital records office? Would you like to see a webpage that has all of our forms in one place? How would you like to find out about updated forms? MR&C? GovDelivery? Does the form have Minnesota’s “new look”? Did your county or facility modify an old OVR form to meet your needs? Does your modified form match OVR’s form in terms of tangible interest or other data fields? Does the form have a 2017 date on it (not a date field)? If you answered no to any of these questions, you do not have the most current form with the most current content. You need the most current form so that customers can apply for and obtain certificates under the correct tangible interest category. SPECIAL NOTE: OVR has a new Medical Certifier and Designated Staff User Agreement (PDF) that contains additional information fields we need to set up medical certifier MR&C user accounts. Please be sure to complete the updated user agreement when you sign up to become an MR&C user or if you assist a medical certifier in becoming a user.